Autumn has arrived at Maxwell Suite! Maxwell Suite is a Chalet style private getaway set a top of Trepanier Bench on 6.2 acres of beautiful forest, great views and surrounded by so many amazing wineries. Just ten minutes to downtown Peachland or West Kelowna . Take a stroll along Beach Avenue Peachland and enjoy the lake, great dining, boutique shops and many sidewalk cafes. Come stay out in the country with us in our cozy Chalet Suite! Hi and Welcome to Maxwell House Suite. I have always wanted to run my own vacation suite and my dream has come true! Come stay with us for a country retreat yet only ten minutes to Peachland or West Kelowna, you won't be disappointed! I am so happy to have you as a guest! Built with Guests in mind, come enjoy the serenity of our private 6 acres, sit out under the stars and breath the fresh mountain air! 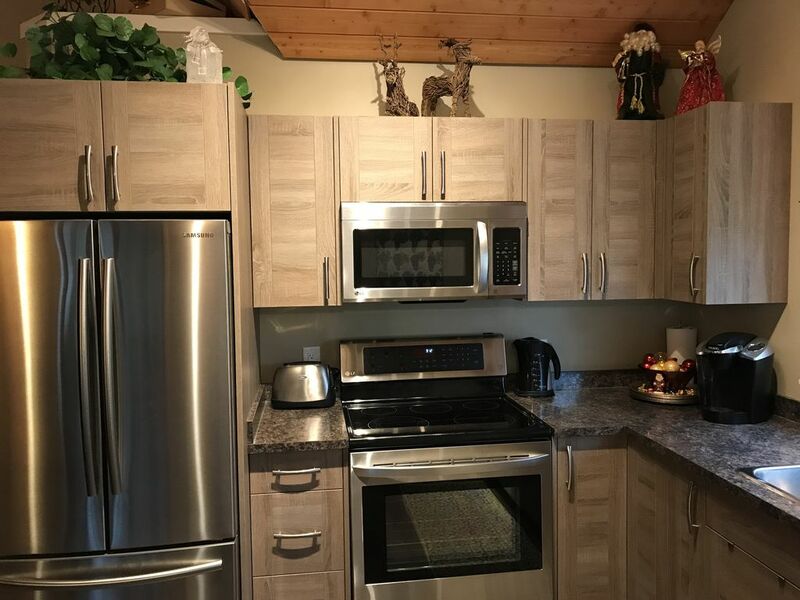 Peace and quiet, your own private space and outdoor area, great for BBQ's and family and of course, your furry family members with love going for long walks on our property. Take a quick drive down to Peachland and walk along Beach Avenue for lots of great restaurants, shopping and enjoy a glass of local wine or craft beer. Your Suite looks at Pin Cushion Mountain, excellent for avid hikers! My brother and I stayed for 2 nights and were pleased with the accommodation. No detail was overlooked. The unit was very clean, organized and convenient. It was less than 10 minutes away from Westbank. What you see is what you get and therefore deserves the 5 star recommendation. My only concern was the sandy driveway. My good shoes needed a thorough cleaning. Great place, good location, clean and bright. This was a great place and the location was not far from West Bank or from Summerland. It was quite easy to get to, a little fiddling to come off of the Connector going East but after that it was great. The suite was very well appointed and very clean. The angled walls in the living area were a bit of a hazard. We had one head bang and a couple of very close calls. The scenery through the windows was beautiful. The suite itself was very quiet but you could hear the highway when the windows were open. Very nice place in a quit & relaxed setting. Great place would stay there again. Maxwell House is a treasure! Comfortable, well equipped, and friendly, it is everything we were looking for for our stay in Peachland. The suite is brand new, and has all (actually all) the comforts of home: complete kitchen supplies and high-end appliances, two cozy bedrooms, a gas fireplace, big screen tv with all the channels, ample storage, dedicated parking, a natural gas bbq - the list goes on. The property is up in the hills, so you are not walking to Peachland for supplies. But that is part of the charm. The area is peaceful and relaxing, and 10 minutes to the lakefront (and the must-go Bliss cafe) or 25 minutes to Westbank. The only reason I hesitate to review Maxwell House is because I don't want it to be booked before my next visit! We came to Peachland for my brother's wedding and needed a place that was close and pet friendly. Firstly Sara was an awesome hostess, she responded very quickly to our booking request and any other questions we had. The suite was so charming!! It was immaculately clean, well equipped kitchen, plenty of bath towels, everything you might need was there! We totally enjoyed our stay here!!! Thank-you so much and please come and stay with us again soon!